When University of Wisconsin-Stout junior Hana Buttles started her internship at the Dunn County Jail, she was nervous about teaching art techniques to inmates. However, the art education major from Iola realized that her internship with PAINT — Program for Arts Integration for New Teachers — through Arts Integration Menomonie made her a better teacher. Buttles started teaching at the jail during the spring semester and is continuing this fall semester. She teaches different techniques to a group of 10 to 12 inmates. Menomonie school district’s week-long art camp offers an array of arts-based programs to elementary kids. From visual arts to performing arts, Menomonie school children and teachers celebrate the arts of joy and imagination. In a collaboration with Arts Integration Menomonie, classroom teachers work with professional artists to enhance teachers’ skills and confidence in using arts-integrated instructional practices. For the second year, pre-service teachers from UW-Stout’s Art Education program are among the camp's teaching artists. Tami Rae Weiss, executive director of A.I.M., calls it a “win-win-win” in which the Stout students gain classroom management expertise while the career teacher explores innovative arts skills and media, and community children reap the rewards of meaningful arts education. What defines “good” art, anyway? That’s a question asked of third- through fifth-graders in Menomonie school district’s summer school art camp. The week-long summer school camp partners with Arts Integration Menomonie (A.I.M. to invite teachers and children to explore different artistic avenues from visual arts to theater arts. “To open that conversation with children and have conversations about aesthetics with 8-year-olds, it’s pretty powerful learning, not just about content, but about life,” Weiss said. “Through this class, children can begin to understand the importance of sharing a message. After learning that visual art can communicate feelings, ideas and messages, students had to think about what they wanted to convey through their own work. The canvas project, for example, convey messages about self-love, empathy and positivity with bold, bright colors. They will hang in the district’s school buildings. “That that message could change somebody’s day or change somebody’s attitude about life — that’s a pretty powerful thing for a kid to think about, to realize they make that much of a difference on other people,” Weiss said. Weiss will speak from 9 to 10:15 a.m. Saturday in the Great Hall on “Beads and Breakdancing: Understanding Empathy Through the Arts.” In a multimedia presentation, Weiss will share various arts strategies from dancing to doodling through which teachers can cultivate empathy with even the youngest of learners. Despite the unseasonable chill outside, these youngsters warmly embraced the chance to create rainbows and other art as they took part in P.A.I.N.T. Saturdays, a free 2-hour class offered through Arts Integration Menomonie, a collaborative partnership among University of Wisconsin-Stout's Art Education and Early Childhood Education programs, the School District of the Menomonie Area, and the Menomonie arts community. Taught by UW-Stout pre-service teachers in the university library, P.A.I.N.T. stands for Program for Arts Integration for New Teachers. K-5 students were invited to register to learn art basics using a variety of media and materials. For information about future sessions, visit http://www.artsintegrationmenomonie.org/paint-community-classes. A UW-Stout program that integrates art into school curricula and the community in Menomonie has received a statewide award from the Department of Public Instruction. Arts Integration Menomonie , a grant-funded program in its fourth year, recently was one of eight projects honored with the DPI’s 2017 Standing Up for Rural Wisconsin Schools, Libraries and Communities Award. “We are honored and grateful to receive this award, and it serves as affirmation that our programs are having a positive impact. The work that we are doing through AIM is evidence that teaching through an art form makes learning come alive for students. It is also evidence that Menomonie's teachers work tirelessly to impact on our children's futures. Teachers are the heart of education," Weiss said. Article by AIM's Mindfulness Specialist! "Nonjudgmental Mindfulness Practice..."
January is that time of year we embark on our radical plans for self-improvement. We look at ourselves with dismay, berate ourselves for mistakes and poor choices made in the past year, and come up with a long list of the ways we are going to eat healthier, be more fit, get organized, and improve our flaws. We charge ahead with this ideal in mind, ready to take on the new year. And then by the end of January, we are right back where we started, failing to meet our lofty expectations and kicking our self for blowing our New Year’s resolutions once again. It is an all-too-familiar cycle. Mindfulness practice is one way to interrupt this painful cycle. Mindful awareness can support us in making wise, healthy changes that we can sustain throughout the new year. A.I.M. Executive Director, Dr. Tami Rae Weiss, and Michael Thompson, Deputy State Superintendent. Weiss accepts the award on behalf of UW-Stout. Projects that strengthen schools and communities to be recognized Oct. 31, 2017 in Wisconsin Dells by the Department of Public Instruction. MADISON — Eight projects will receive the 2017 Standing Up for Rural Wisconsin Schools, Libraries, and Communities Award during a program and reception Oct. 31 in Wisconsin Dells. Presented each year to nominated projects that “demonstrate the great potential and collaborative spirit of rural Wisconsin,” this year’s recipients join 105 exemplary programs recognized since 2005. Nominated by education and library professionals, the 2017 award winning programs will be recognized during the Wisconsin Rural Schools Alliance conference (Oct. 30-31) in Wisconsin Dells. Arts Integration Menomonie (A.I.M. ), an arts education program at the University of Wisconsin-Stout, integrates the arts into the community and neighboring schools. From painting murals in school buildings to evening programs for children to work on art projects with future art teachers, the A.I.M. partnership promotes collaborative models of teaching among classroom teachers and UW-Stout students. The outcomes of the partnership have potential to enhance teacher competence and confidence and to improve the retention of pre-service teachers and early career teachers within the teaching profession. Another impact of the arts integration partnership is to improve appreciation for the arts through evenings of entertainment or enrichment at the Mabel Tainter Center for the Arts, a partner in the project. The University of Wisconsin - Stout Theatre presents its spring musical “Seussical”, and A.I.M. 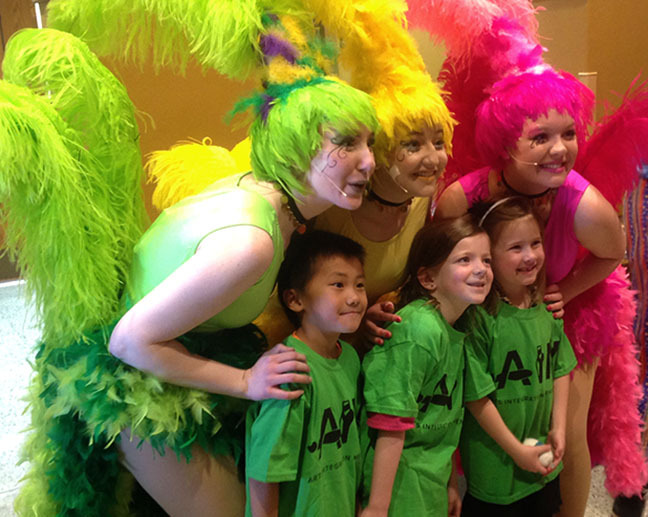 (Arts Integration Menomonie) sponsors special performances for local children in the Menomonie school district. The stage of historic Harvey Hall Theatre at University of Wisconsin-Stout will come alive this spring with some of the beloved characters from the stories of Theodor Seuss Geisel, Dr. Seuss. The musical encompasses arts integration at its best, featuring the story and characters of the brilliant Dr. Seuss, integrated in children’s literature, language arts, poetry, music, drama, storytelling, and visual arts (and more!). Students of teachers who took part in this year’s CITA cohort will attend the performance at Harvey Hall free of charge. MENOMONIE — Wakanda Elementary School 3rd-grader Skylar McLeod placed a glass tile on one of the white pillars in the school cafeteria. The pillar is one of four decorated Thursday by all the elementary students and many staff members, and will depict each season. The season-specific mosaics are part of an art project through Arts Integration Menomonie, and will be a permanent part of the school. Fellow student Zuma Hazwood said she enjoyed attaching tiles to the pillars. The tile project started in September and is expected to continue until late January, said Jeanne Styczinski, who designed the mosaics and serves on on the Arts Integration Menomonie executive board. Two UW-Stout students, Marko Pechink and Olivia Revolinski, are teaching the elementary students how to tile as part of AIM’s Program for Arts Integration for New Teachers. LONG-DISTANCE CONNECTION. Menomonie children connect with children in Botswana via Skype during a PAINT International art session at the Mabel Tainter Center for the Arts. At right is Megan Steinkraus, PAINT coordinator, Menomonie elementary art teacher and UW-Stout alumna. Arts Integration Menomonie is going outside of Menomonie – actually outside of the country – to bring new art experiences to children in the Menomonie school district. This fall, AIM is hosting PAINT International on Saturdays at the Mabel Tainter Center for the Arts. PAINT stands for Program for Arts Integration for New Teachers. Each Saturday morning, local children from kindergarten through fifth grade create art under the direction of two UW-Stout art education students, Molly Brion, of Cameron, and Gabrielle Conway, of Rochester, Minnesota. UW-Stout alumni mentor the UW-Stout students. During the sessions, the children connect via Skype with children in Letlhakeng, Botswana, Africa, who are working on the same art projects. The children renew friendships each week and compare their art. MENOMONIE — Menomonie second-grader Miranda Boerner used pastel colors to create a swirl of color, depicting motion. She held her picture up to a computer camera to share it with students working on a similar project in Botswana, Africa. A student from Africa showed Boerner his picture. Art becomes a catalyst for children across the globe to connect with one another. Arts Integration Menomonie’s Program for Arts Integration for New Teachers is sponsoring the weekly art classes at the Mabel Tainter Center for the Arts. The classes will be Saturdays through Dec. 10. The idea to have children use video software and connect in real time and share artwork grew out of a former student of Weiss’ in La Crescent, Minn. Kirstin Benish, a Peace Corps volunteer, wanted to start a pen pal group to help children learn English in Botswana. The idea for the art project grew from that. AIM sent art materials to the children in Botswana. Arts Integration Menomonie is going outside of Menomonie — actually outside of the country — to bring new art experiences to children in the Menomonie school district. Each Saturday morning, local children from kindergarten through fifth grade create art under the direction of two University of Wisconsin-Stout art education students, Molly Brion, of Cameron, and Gabrielle Conway, of Rochester, Minn. UW-Stout alumni mentor the UW-Stout students. Arts Integration Menomonie has named its CITA participants for the 2016-17 academic year, when it will expand to twice as many local elementary schools. CITA — Co-Teaching In and Through the Arts — pairs local elementary teachers with professional artists. Through co-teaching, the teachers and teaching artists use various art forms to deliver standards-based curricula. AIM’s mission is to use arts integration to support teachers, providing them with creative tools for instruction through the arts. The goal is to “increase the likelihood of retaining those educators in their teaching career,” said Tami Weiss, a University of Wisconsin-Stout assistant professor and executive director of AIM. AIM’s mission is to use arts integration to support teachers, providing them with creative tools for instruction through the arts. The goal is to “increase the likelihood of retaining those educators in their teaching career,” said Tami Weiss, a University of Wisconsin-Stout assistant professor and executive director of AIM. AIM is a grant-funded collaborative program with UW-Stout, the School District of the Menomonie Area and the Mabel Tainter Center for the Arts. Two art education students from UW-Stout have completed a large-scale art installation at Downsville School in Downsville – and in the process kept thousands of bottle caps out of landfills. Abby Henderson, of Eau Claire, and Grace Rogers, of Clear Lake, who are part of Arts Integration Menomonie, began working on the project in February. They spent about 45 hours on the mural, which is seven feet high and 14 feet wide. With help from family and friends in the final stages, the project was completed in the spring. The mural is in the style of artist Chuck Close and encompasses the theme of sustainability, utilizing approximately 7,000 recycled bottle caps. Three Arts Nights, featuring performances by local teachers and young students, were held recently by Arts Integration Menomonie to complete the inaugural year of the Co-Teaching In and Through the Arts program. The Arts Nights, held at the Mabel Tainter Center of the Arts, showcased examples of arts-integrated lessons taught this spring as part of the Menomonie school district’s curriculum. CITA pairs early childhood educators with professional teaching artists to deliver standards-based curricula through art-infused lessons. CITA included birth through third-grade students in five Menomonie schools, 15 teachers and eight UW-Stout education majors.